12. 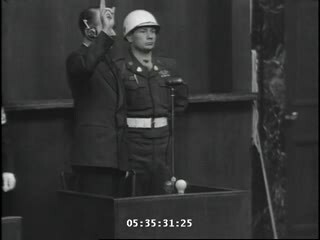 A member of the Russian delegation addresses the court at the International Military Tribunal trial of war criminals at Nuremberg. 13. 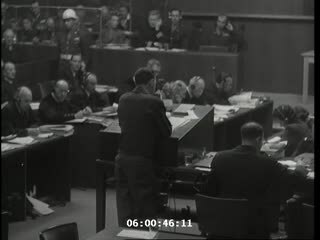 American army staffers organize stacks of German documents that were collected by war crimes investigators as evidence for the International Military Tribunal trial of war criminals at Nuremberg. 14. 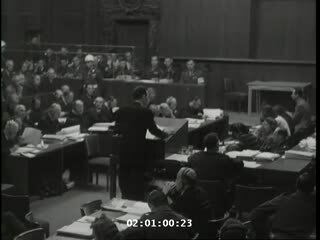 American Major Frank B. Wallis (standing), a member of the trial counsel and trial preparation legal staff, presents the prosecution's case to the International Military Tribunal at Nuremberg. 15. American military policeman Sgt. 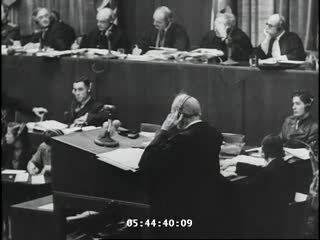 Peter Misko peers into the cell of defendant Hermann Goering during the International Military Tribunal trial of war criminals at Nuremberg. 16. 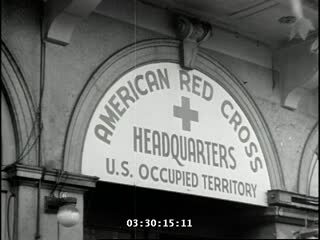 American military police man their posts at a session of the Doctors Trial. 18. 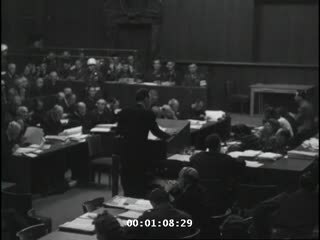 American Tribunal member Francis Biddle prepares for the International Military Tribunal trial of war criminals at Nuremberg. 19. American Tribunal members Francis Biddle (left) and John J. Parker (right) discuss evidence in their offices at the Palace of Justice before the beginning of the International Military Tribunal trial of war criminals at Nuremberg. 20. An American military soldier serves Wilhelm List with his indictment at the beginning of the Hostage Case.